(Sorry about this dreadful pun-laden anecdote, but this film thing really has gotten a bit out of hand . At last somebody with more GAS than me! The wicked thing about this is that all the gear in the top photo cost around the same as a mid-level pro-am DSLR body only (think Nikon D610 or maybe a D750). As for GAS, the 35mm gear in particular was cheap, a couple of the bodies cost nothing in as-new condition, same with a couple of the lenses (including the increasingly popular Helios 44-M on the Praktica LB-2). The Olympus OM-1 was a princely AUD $70 with Sigma 28-70 zoom, Tamrac clutch-case and camera strap. The Olympus 75-150 zoom set me back AUD $89, though, but it is in unused condition. The medium format lenses are either actual German Carl Zeiss or Soviet (Kiev) made lenses based on Zeiss designs and made by ex-Zeiss technicians with Zeiss equipment transported from the original Carl Zeiss factory in Jena to Kiev as the Cold War was ramping up. I bought the Mamiya gear from KEH back in 2009 or 2010 - the lenses were new in their boxes and all cost around the USD $100 - $150 mark. The bodies were around USD $250 each, from memory, at a time when the AUD was around parity with the USD (which is no longer the case, unfortunately, we've returned to historically average 70 US cents to one AUD). The main unforeseen expense has been due to misinformation from eBay sellers, particularly when returning a not-as-described faulty camera or lens simply wasn't worth the money. The plus side to that is that I am building up a pretty awesome spare parts collection. The other good thing, along with the aid of YouTube how-to-fix videos, is that after a couple of initial failures I am becoming increasingly competent in maintaining this gear, from stripping down lenses for CLA to servicing and even repairing the camera bodies. Making a mistake with this stuff isn't the bank-breaking deal that messing with a digital camera's internals can be, let alone trying to get into a modern AF lens without destroying it completely. It is all wonderfully free of wiring, CPUs, transistors and other voodoo stuff, and just has lots of mechanical linkages and gears which you can see and figure out as to what goes where. The main use for a multi-meter when dealing with the simple wiring that may exist is to either check for continuity in aged wires or to check if battery voltage is good. Even an electronic ignoramus like me can figure that out. You’re tempting me to have a rummage around the cupboard and then buy some batteries and a roll or two of film. I’ll need to rummage a bit further than the back of the cupboard to get some old manual Russian gear. 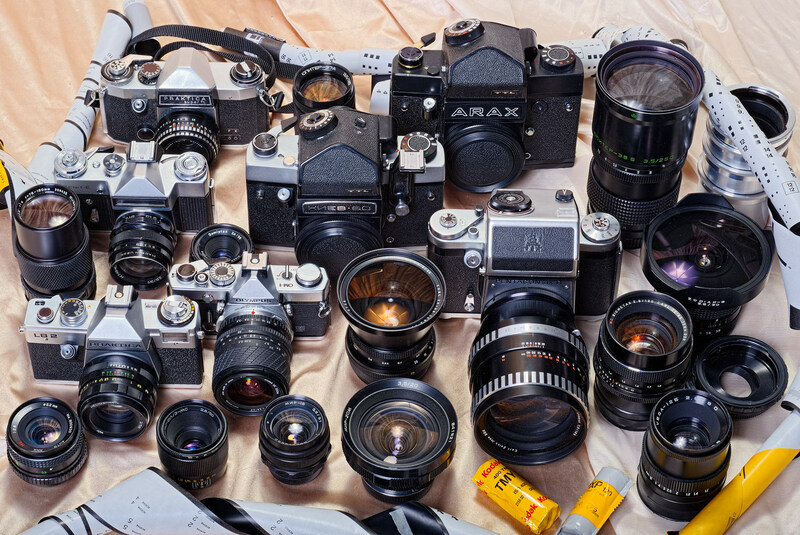 That's quite the assortment of old manual focus lenses. Lately, I've been buying up cheap Bronica medium format lenses and I using them on an SQ/Pentax adapter. The look and bokeh of some of these old, 5 or 6 element, manual focus lenses is very nice. Also, they are really easy to take apart and CLA. I have to temper this by commenting that my current delving into the old technology is greatly aided by the fact that I never dispensed with my fully equipped, custom built darkroom, which has quietly waited for the digital decade that rendered it redundant for work to fade as my retirement loomed. Having now been back in the darkroom for over nine months, I have to say I'm enjoying the experience immensely, and am still reminded every time I walk into it as to exactly why I chose to pursue photography as a career at the beginning of 1971. Digital was barely a speck on the horizon back then, computers did little more than display expensive green numbers on CRT screens or drive "Pong" games in the local pub, and any prospect of them and the cameras that use them for imaging purposes supplanting film as the mainstay of photography wasn't even considered. While I appreciate that digital enabled greater and better output in my field of photo restoration that I eventually made my main business, from an enjoyment and skill point of view digital failed miserably for me, as well as opening up the field for anyone with little more than a DSLR, computer and software to market themselves as a "photographer", with apparently no need for much in the way of actually understanding photography itself. From my observation, the business is now primarily comprised of people who have another job as their main career, with photography being a part-time cash money earner to supplement their primary income - the exact reverse of what used to be the case, in fact. These days, with that no longer a concern for me, I choose to spend my remaining years only doing what I enjoy, and digital photography was never really one of those things, even though I did find it fascinating at times as to what it could enable one to achieve that film technology couldn't (seamless stitching, focus stacking, HDR and an colour manipulation being just a few), although the personal skill levels required beyond learning which keys to press were small indeed. With film the opposite is true - while anyone can process a film, having the skill and knowledge to make it actually work for you is more an intuitive thing than simply learning basic procedure, and that's the bit that I really like. I never developed as a habitual digital chimper - years of film experience had given me the confidence of knowing when I had the shot or not, and I'm finding that old film confidence once again as chimping isn't even an option now. I'm also finally realising that the brand name on equipment is probably the least important thing, as using the 30+ year-old Soviet equipment is proving to me. You don't need a Hasselblad to take a great shot on 120 film, in other words. A Zeiss lens from Jena is every bit as good as one from Oberkochen despite a popular conception that they're junk - cold war propaganda has a lot to answer for. All my equipment has been well used by who knows how many people over the decades, and yet still provides reliable service and results I'm happy with in 2018, a future I cannot see for any of today's digital cameras. With the exception of a few dedicated collections, few digital cameras will survive in use for much longer than five years or so. The same can be said for the majority of digital photographs that are taken these days - most will not last much beyond a few weeks, let alone years or the next technology change, yet at present I'm sifting through B&W negs I took in the 1970's, still all in perfect order and as ready as ever to be printed. I'm obviously not the only one on this trip - film sales are increasing, some manufacturers are re-introducing discontinued films, and whilst the glut of old film cameras on the used market currently makes manufacture of new cameras uneconomic, the rapidly increasing prices of that old gear as supplies diminish probably mean that it's only a matter of time before that, too, recommences to some degree. If you are right, there may still be hope that Zeiss will restart production of their wonderful Ikon rangefinder camera. The Russians or Ukrainians will probably be first off the mark (and they did do a reasonable job of copying the Contax rangefinder back in the 20th Century) - they probably still have a few warehouses of parts left over from the Communist quota systems. It'll still be a way off - original cameras are still dirt cheap and readily available which discourages new manufacture. What I'd really like to see is a new version of a 120 6x6 format camera, however that's probably just wishful thinking. Even Russia stopped making them by 1991. Alan, are you shooting all medium format now, or are you also shooting 35mm film? In the dark room are you printing strictly black and white, or are you developing and printing color film/slides too? What print sizes are your favorities? I'm shooting mainly 120 6x6 at the moment, my 35mm cameras are being used by people I'm tutoring to take films so we can get on with the processing part. I still can't get over my dislike for the RB67 (if you've had to shoot entire weddings on one of those beasts you'd understand my animosity towards that boat anchor of a camera) so I haven't shot anything but the odd roll or two with it over the past 10 years. Printing is still a bit of a way down the track, though, I'll get the students producing good negs first. It will only be B&W as well - I've never thought much of colour film as there's not much you can do with it outside of standard procedure, the equipment and processing tolerances are more complex, as well I think that digital does a better job of colour with far more flexibility. My expertise is in B&W, so I'm sticking with that (plus I prefer it aesthetically, anyway). If printing on photographic paper most sizes available now are rectangular (I liked it back in the old days when 12.5x12.5" was available), so 6x6 full frame always involves wastage, and I'm really concentrating on shooting square at the moment to regain skills that have faded in the past 15 years of 2:3 shooting with digital. I figure that 8x10 paper is the easiest to use from a price and lesser waste point of view, 12x16 (or12x12) is about the right size for medium format, 16x20 (16x16) is still OK but I always thought 20x24 was pushing it a bit hard, both from a quality point of view, and for a convenient viewing distance. If printing digitised negs with inkjet I'll not go bigger than 16.5x16.5, which is why I didn't replace my worn out Epson 7800 with a new 24" printer, but opted for the more convenient Epson SC P800 17" (with roll paper holder). 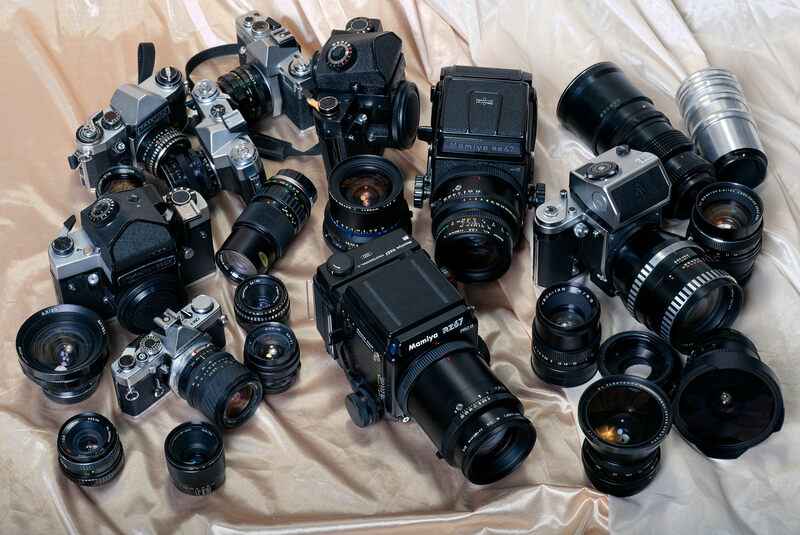 I too shot various interchangeable lens medium format film cameras back in the day. Although my favorite medium format by far was a TLR (Minolta Autocord). I preferred it over my Hassy and Bronica rigs. 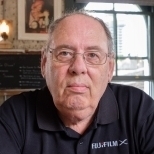 Have you considered using TLR cameras? Being cheaper, TLR might be the logical next step for your B&W film photography students. Good TLR cameras are surprisingly expensive these days, plus the supply of lenses is somewhat restricted, if indeed the TLR has interchangeable lens capability. At present the old Soviet Bloc SLR 120 gear is still the cheapest, in particular the lenses (although they're escalating in price now as well). A good Mamiya C220 will cost twice what an equivalent condition Kiev-60 will cost, and even a Pentacon Six TL will cost a third less than the Mamiya. Even a cheap LOMO Lubitel TLR with fixed lenses costs more than a Kiev-60! Granted the Soviet stuff can be a bit hit-or-miss in quality, but all these cameras are 30-50+ years old, so that's likely to be a consideration for all of them by now. I also think that a TLR might confuse, rather than help, students who've never used anything other than a digital or DSLR in their lives. It's proving a large enough gulf to cross in having to actually calculate exposure and manually set shutter speed and aperture for most as it is. I have culled the worst eBay suppliers down (at my own expense, unfortunately), and have a list of four who I've bought from and received goods better than described, not worse as seems to be the general eBay standard. One seller in particular is obviously a camera mechanic and actually does CLA when he says so, and the lenses and camera I've bought from him have been flawless, so of course I watch his store listing like a hawk! His prices are also as cheap, if not cheaper than the shifty sellers, so if he ever pops up with a Rolleicord or Ikoflex for a couple of hundred bucks, I'll probably buy that regardless. At present he seems to have landed on a warehouse of old Pentacon Six cameras, which he's CLA'ing and selling at a trickle rate of one every week or two. Anyhow, I'm only buying sporadically now - last July our politicians obviously decided that their pension fund wasn't big enough, so they slapped GST and import duty on all imports under $1,000 AUD (which had previously been duty and tax free), and with the Australian dollar having further devalued in recent months (and GST/duty & bank transfer fees being calculated on the total amount including postage), what was affordable gear is suddenly costing substantially more - I recently saw one purchase escalate by almost a third after I hit the "commit to buy" button. I just know know it’s gonna be bleeding obvious when you tell me! Back in the 20th century, I recall nearly causing an overly bumptious computer salesperson to have a heart attack when I refused to buy their latest and greatest offerings due to their not meeting my requirements and that I then made matters much much worse when I reminded them of the old gag that what the IBM abbreviation really meant was that "Its Better Manual". Hugh, just a gentle tease as I’m sure Alan knows! There's zero chance of me ever succumbing to wet plate photography, however I have a kilo of mercury obtained in the late '80's with intent of producing a daguerreotype or ten, which may or may not happen. There is an original Thornton Pickard half plate camera in negotiation at present, and its brass Dalmeyer lens should make for the perfect rig. No worries, Mike, although I've seen enough of the 21st Century by now to know that in general it displeases me greatly, and reliving times through a 6x6 viewfinder and recording images on film, albeit at a rate of about 10-12 frames per week is really giving me more satisfaction than digital, with all its fanciful promises, ever did. I'm also getting quite a charge out of actually CLA'ing some of the old gear - today I just finished completely stripping and reassembling a Carl Zeiss Jena 2,8/80mm Biometar lens which arrived looking as if it had earned every one of its 60-odd years, but is now glowing with newly polished alloy body and sparkling clean optics, as well as smoothly focusing with cleaned and re-greased helicoid rather than trying to turn the lens mount out of the camera when focusing as it did when I got it last week. This is the first time I've actually dismantled the individual lenses from the body for cleaning, and it went really well - three of the elements had rather heavy haze spreading from the edges towards the centre, they are now crystal clear and ready for another few decades of use. Alan, if what you do gives you pleasure then rock on! When you get to your venerable age😊 you tend to need simple pleasures to keep yourself amused.